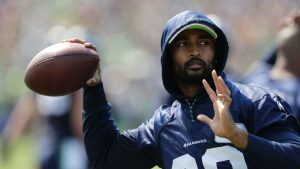 Seattle Seahawks wide receiver Doug Baldwin’s latest knee injury could keep him out at least a couple weeks, coach Pete Carroll said. The Seahawks could also be without linebacker K.J. Wright for a second straight game when they play the Bears in Chicago on Monday night. Carroll said Monday on his 710 ESPN Seattle radio show that it would take a “miraculous return” for Wright to make it back this week, though he was more vague Tuesday about Wright’s potential availability. Baldwin went down in obvious pain in the first quarter of Seattle’s 27-24 loss to Denver. He tried to limp off the field before he went down again and had to be tended to by Seattle’s medical staff. Baldwin eventually walked off the field on his own power and returned to the game later in the first half, but he was on the sideline in street clothes after halftime.